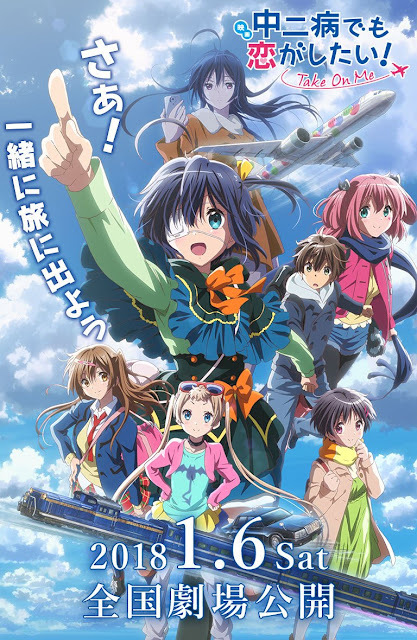 PennsylvAsia: 2018 movie Love, Chunibyo & Other Delusions The Movie: Take O (映画 中二病でも恋がしたい！ -Take On Me) in Pittsburgh, November 4. 2018 movie Love, Chunibyo & Other Delusions The Movie: Take O (映画 中二病でも恋がしたい！ -Take On Me) in Pittsburgh, November 4. The 2018 Japanese animated movie Love, Chunibyo & Other Delusions The Movie: Take O (映画 中二病でも恋がしたい！ -Take On Me) will play in Pittsburgh on November 4. Rikka is now a third-year student, but she still has "chūnibyō" syndrome. University entrance exams loom on the horizon, and it's spring break, and Yūta and Rikka are together as usual. One day, Rikka's older sister Tōka declares that she's going to take Rikka to Italy with her, as Tōka is moving to Italy for work and she thinks they should move together as a family. Yūta understands Tōka's opinion, but thinks that at this rate he and Rikka will be separated. Shinka and the other members suggest that Yūta and Rikka should "elope," and thus sets the stage for Yūta and Rikka's travels throughout Japan in their escape drama. The movie plays in Japanese with English subtitles at the Southside Works Cinema. Tickets for the 7:00 pm show are available online. The theater is located at 425 Cinema Drive in the Southside, one block from the Hot Metal Bridge (map).